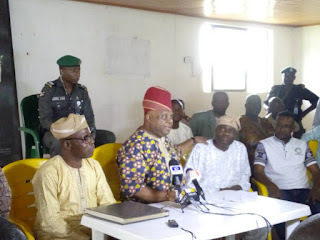 The candidate of the Peoples Democratic Party in Osun State in the September 22 governorship election, Senator Ademola Adeleke has said that his performance as a member of the Senate should serve as strong conviction to the people of the state that he would definitely deliver better if elected governor. Addressing a press conference after the court dismissed the suit challenging his eligibility to contest the election, Adeleke said he was only being attacked by "distractors" who are jittery of the electoral loss that awaits them. He said the media space had been awash with fake news of various dimension over his alleged forged testimonial and school leaving certificate insisting that they were all lies calculated to mess up his family name as well as weaken his party. The Senator who prooved that he actually attended Ede Muslim Grammar School between 1976 and 1981 by introducing some of his classmates said he was popular in school and also served as the president of the school alumni until recently. He said, "I recognize the concerns the electorate will have as to my competence and capabilities to run and rescue our dear Osun state from the mess we have found ourselves at the hands of Aregbesola, every candidate seeking to be governor must be subjected to this competence test and I make bold to say that my records of service and achievements as a Senator representing Osun West in just one year will answer the questions and lay your minds to rest. "Since I got the privilege of your mandate to be elected as Senator, I have worked assiduously and tirelessly to deliver to my constituents, within 12 months I have promoted 2 Bills and moved a motion of national importance on the floor of the red chambers, my motion for community policing is receiving widespread acceptance and debates nationwide. In addition, I have executed 18 people impact projects across the 10 Local Government Areas that make up Osun West Senatorial District. "As a performing Senator, I have proved that I have capacity to deliver on set programs and agenda, performance and people impact is the best answer to any question about competence or capability and we have answered that loudly with our results. My passion and commitment to the betterment of the lives of the good people of Osun remains unmatched and that is what is scaring my detractors, they know the people can feel our positive impacts and are eager to vote PDP in, they are afraid of the monumental loss that awaits them come September 22nd, 2018. "Now that legal pronouncement has been made, now that the party internal mechanism has been exhausted, it is time for all PDP members and leaders to unite and work for victory in September. Electoral contest can be bitter and rancorous. After protests and grievances will come reconciliation and brotherhood. It is time to place the masses’ interest above personal considerations. Osun people are earnestly waiting on PDP to deliver them from this oppression and poverty, as the hope of the Osun masses, We cannot afford to disappoint them. "Please permit me to say this. I am fully prepared to deliver good governance if elected into office come September. What Osun people desperately desire now is eradication of poverty, workers' welfare, tackling of crippling debt, job creation among others. "My good people of Osun state I know how to deliver on your expectations. I am one of you, I grew up here and live amongst you, therefore I know where the shoe is pinching you. If I can deliver as a Performing Senator, I will definitely deliver efficiently as Governor of our dear state. I promise I will be a peoples' governor I am committed to you, please rally round us. There is light coming to end this darkness of poverty and suffering."